Gaems is a company that is mostly known for their portable gaming stations that double as console transport cases. These cases securely house your current-gen consoles, controllers, and all of the necessary cabling in a neat and easy to handle carrying case. When the case opens up, it exposes an imbedded HDMI-ready stereo monitor, allowing you to neatly plug in your console, monitor and all of its cabling to open up as a portable gaming station. It is such a simple yet effective product that provides console gaming the kind of portability that is hard to find anywhere else. We have been seeing these Gaems case-station combos at conventions, product demos, tournaments, and parties. However, how about a solution for gamers who already have a bag or backpack for carrying a console around? How about those who simply need a portable gaming monitor that can be set up with minimal wiring? 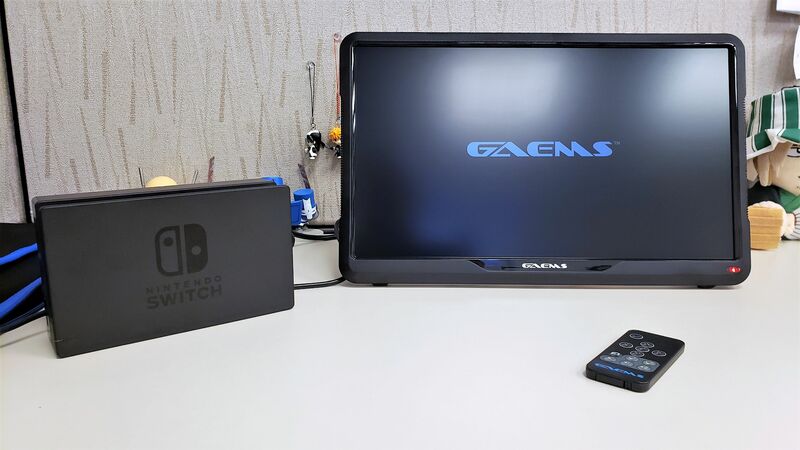 Meet the Gaems M155 Performance Gaming Monitor 1080p FHD, a portable 15.5-inch E-LED monitor that can be powered via USB. 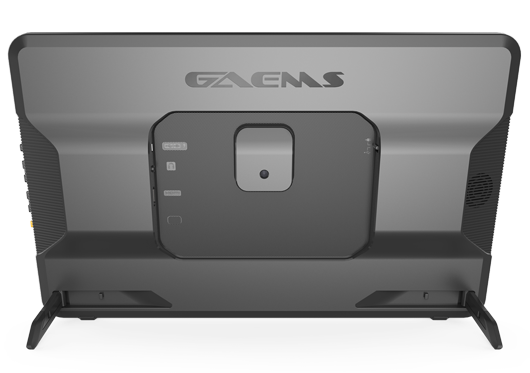 The Gaems M155 Performance Gaming Monitor displays at a 16:9 aspect ratio, reaches a resolution of 1920 x 1080 and has a refresh rate of 60Hz. The M155 features a glossy display finish, an integrated speaker on its rear, an HDMI slot, and a 3.5mm headphone jack. It weighs less than two pounds and houses stow away feet that extend out from the rear of the monitor. When exposed, those rubber feet prop up the monitor at a 12-degree viewing angle. The rubberized feet coupled with the monitor’s rubberized base allows for a very stable and sturdy setup when upright. However, you also have the option to mount the display via its ¼ camera screw socket in the back. 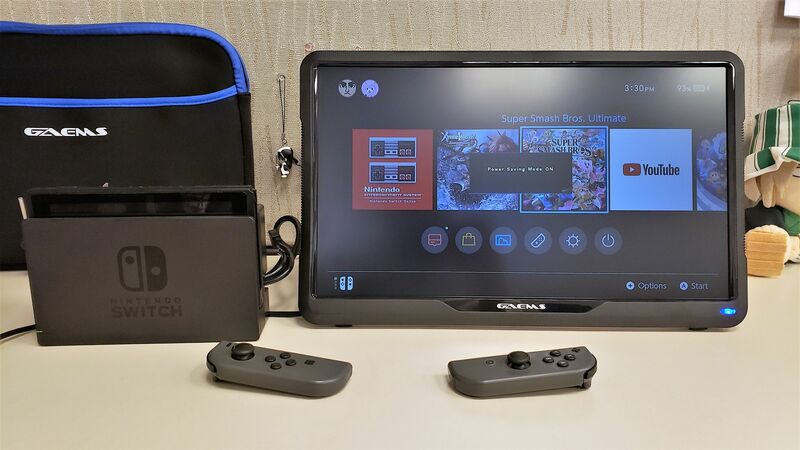 The Gaems M155 Performance Gaming Monitor 1080p FHD comes with a zippered neoprene sleeve, a remote control, an HDMI Cable, a USB “Y Split” power cable, and a power adapter plug. You can opt to use the M155 as you would any standard monitor by connecting it to a wall outlet using the connected adapter. 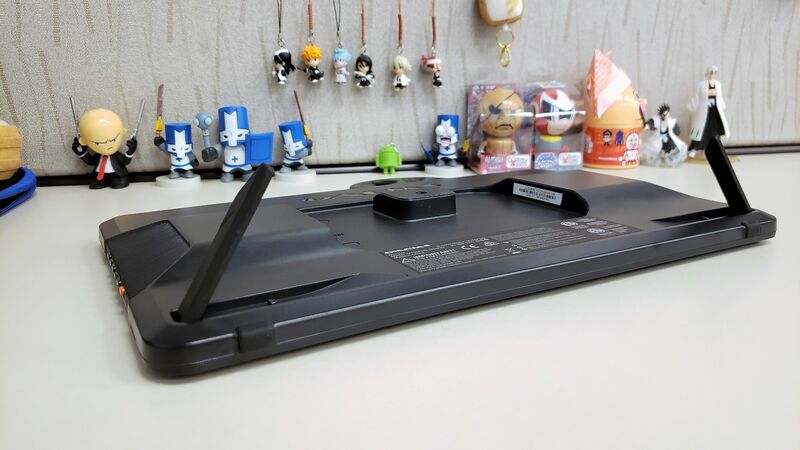 However, the M155’s portability is truly demonstrated when you use the connected console or PC to power the display via USB. Simply flip the switch on the back to the USB icon, and plug the other end of a microUSB to USB-A cable into your console. 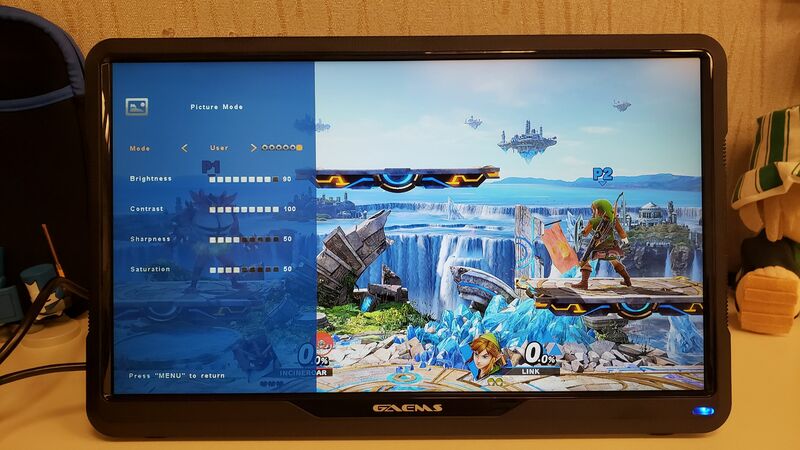 Connect the two using an HDMI cable and you have yourself a console and monitor set-up, without having to plug the monitor into a wall outlet. Just like that, you have a console gaming experience where you only have to worry about plugging in your game console. You have a small and compact remote control that you can use for easy volume and brightness control or to finagle with the monitor’s settings. However, those settings are only in play when its AC adapter is powering the M155. When you are using a console’s USB port to power the M155, the monitor is in Power Save Mode. This disables the M155’s rear speaker and brightness settings with the M155’s display left on a somewhat dimmer setting. You are not completely without sound however as you can plug in any 3.5mm-ready headset and enjoy your game with stereo sound. This is an understandable approach considering that a console’s USB port has limited power output when compared to that of a wall outlet. So how does this play out in this format? Well, even in a very bright office setting, like in these shots below, the display is still quite manageable, showing a good range in color and, most importantly, maintaining that 60Hz refresh rate. 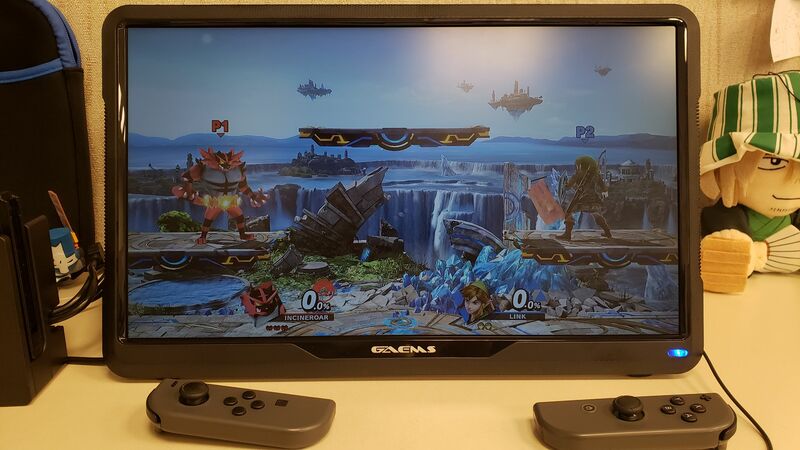 Naturally brighter and colorful games like Super Smash Bros Ultimate display quite well throughout. Some other games shown here, like Dynasty Warriors 8 Xtreme Legends Definitive Edition and Dragon Quest Builders, can be somewhat darker at times. This is where the M155 is better played in darker settings where the Power Save Mode-managed brightness is not even an issue. I went with Dynasty Warriors 8 Xtreme Legends Definitive Edition to see how it played out with its very involved and often-populated screens. 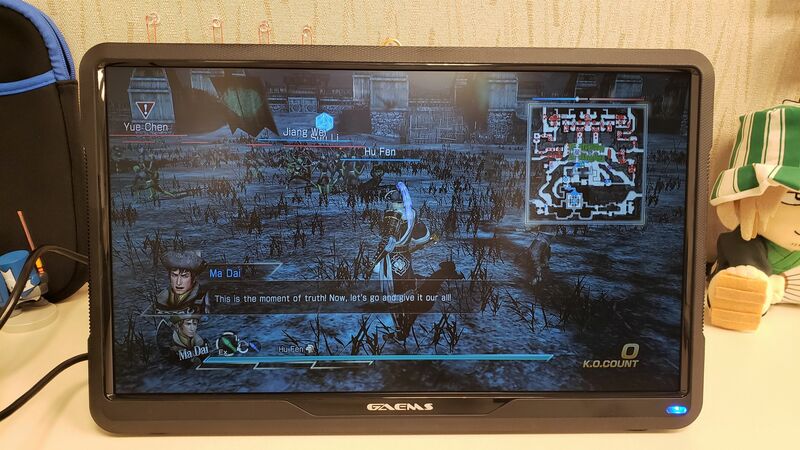 You have small corner maps and screens filled with hundreds of enemies. The M155 handled this game’s display well, nevertheless, allowing for a comfortable, clear and manageable game experience, even on darker maps. Next, I threw Dragon Quest Builders into the mix. The game uses time-of-day mechanics, where gameplay progresses through day and night, offering various lighting scenarios. This, like Super Smash Bros Ultimate, is also a naturally bright game, especially so during the day phase. However, night phases will have you squinting if you are using the M155 in a bright environment. However, if you do not need to be minimalistic with your gaming setup, you can always opt to power the M155 directly into an outlet via its AC adapter. Doing this activates the monitor’s full potential by turning on the speaker, enhancing the brightness, and opening up all of the standard monitor settings for you to finagle. The singular integrated speaker is monaural, but at least reaches a pretty decent volume at its maximum setting. You are not going to sit too far from a 15.5-inch monitor for the most part, so you and any nearby buddies should be able to hear your game well from where you would sit. Even then, mono sound is mono sound, so I would suggest using a headset, wired or wireless, whenever possible. Overall, the M155 is a very interesting and effective solution for console gamers on-the-go who wish to minimalize their power outlet foot print. With one power outlet, you power your console while the console powers the M155. 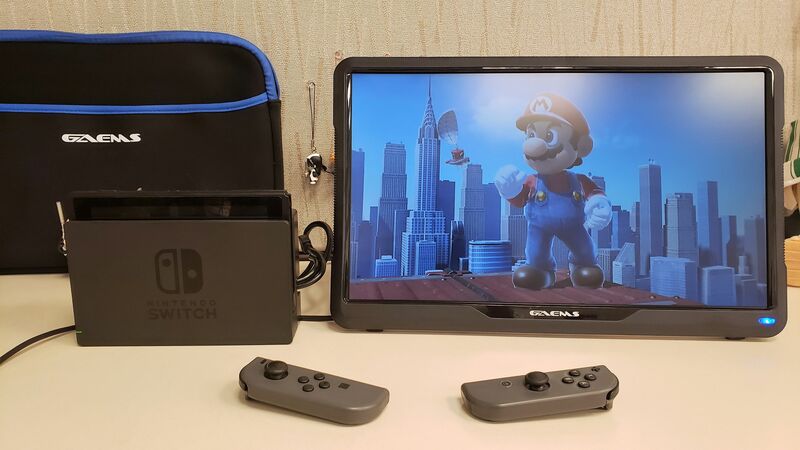 The Gaems M155 Performance Gaming Monitor 1080p FHD and all of its components fit neatly and compact within the included zippered neoprene sleeve. That filled sleeve then fits neatly in most 17-inch laptop bags or virtually any bag that can fit a current gen console. † M155 Performance Gaming Monitor 1080p FHD provided Gaems PR for review.